Take two well acclaimed bands and make them a double headliner for a tour. The results are sure to be excellent. Portugal. the Man and Grouplove took the stage at Merriweather Post Pavillion on Friday, September 13, nearing the end of their Honda Civic Tour. The bands were pumped, the crowd was energized, and the overall mood of the venue was welcoming, ready for a show that will make a mark in anyone’s concert memories. The opening band, Typhoon, did not attract a lot of attention, with the pavilion seats practically empty. If people had arrived on time, they would have been impressed with this indie rock band from Oregon. They are an eleven member group and, more than anything, stood out with their range in instruments. Combining violins, trumpets, shakers, drums, and more, Typhoon created intricate beats and rhythms that could not be pulled off by just any band. The precision and perfection of these sounds is what made Typhoon unique. They had two drums sets, and both drummers locked eyes throughout their performance. The awareness each member had with each other is what allowed them to communicate and set an intense mood on stage. This group does not have the fan base they deserve. They put on an opening performance unlike many, and honestly, have the potential to headline once their name gets around. Hopefully this is in their near future after this tour. Portugal. The Man came on stage next and the crowd immediately became more alive. The seats filled quickly and the pit got more congested as people pushed their ways closer to the front. Not only did the crowd get louder, but as soon as Portugal started playing, the sounds echoed and you knew you were in for a good show. They mostly played tracks from their new album, Evil Friends. 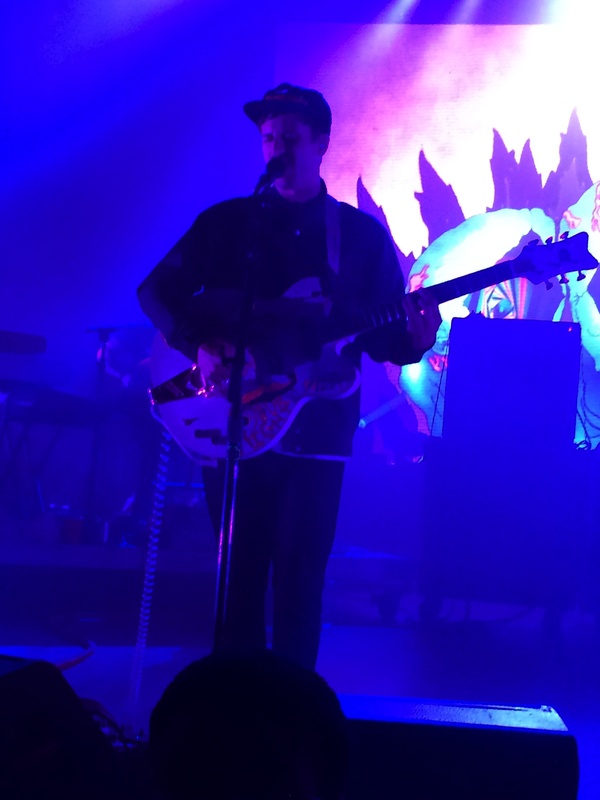 John Gourley, the vocalist and guitarist wasn’t much of a talker, and immediately got right to playing the tunes. The falsetto sound is ridiculously high. How someone can control such constant high pitch sound like him is talent, and to hear it live makes you stand there in disbelief. The bassist, Zachary Carothers was the lively one of the group. He would start spinning in circles during solos, jumping off the stage, and looked like a bee buzzing all around. The live sound of Portugal was much louder than expected. They put on a true rock show and a crowd pleaser. e took the stage and it was like the energy built up for each performance. The cheers from the crowd as the well known, Christian Zucconi (guitarist and vocalist) and Hannah Hooper (vocalist and keyboardist) walked on stage were shockingly loud. Opening with “I’m With You”, the first track on their recently released album “Spreading Rumours”, the crowd got the audience hyped and everyone was on their feet jumping in unison. The entire atmosphere became louder. The crowd knew every word of every line of every track. Honestly, although the voices of Christian and Hannah were spot on, they ended up becoming more of a background as the crowd’s singing, were what became the show. This was an awesome experience, yet at the same time it would be nice to be able to hear what you came to the show for. Grouplove’s energetic and upbeat show was more about the environment rather than the sound. I’m not saying they didn’t sound good, because believe me, they sounded unbelievable live; it was the interaction between the band and the audience that made the show so perfect. Grouplove knows how to put on a show and make each individual person in the audience, no matter how close or far away from the stage, feel like a part of the show.